Do you know what type of spare tire is in your trunk in the event you need to replace a flat tire on the road? Our technicians in our service department at Spradley Kia want to share some important information with you about the difference between a compact spare and a full-size spare tire. 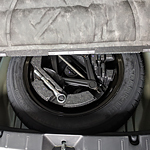 A compact spare doesn't require as much storage space in the trunk as a full-size spare. It's lightweight, making it easy to handle when fixing a flat. But be aware that a compact spare is only meant for temporary driving until you get to our service shop, since it can impair such automotive operations as the speedometer, ABS and traction control. A full-size spare matches your current set of tires. Once in place, you can continue on your trip rather than heading in for service. It does require more storage space in the trunk.